Written by: Nick Arrietta on November 2, 2011. Have you ever played a Dean Dave Mustaine Zero Korina Limited Electric Guitar? Dean Guitars is an American manufacturer of guitars. It was founded in 1976 in Chicago, Illinois by Dean Zelinsky and is currently owned by Armadillo Enterprises in Tampa, Florida. Dean owner Elliott Rubinson performs and tours with major artists that use his instruments like Michael Schenker and Uli Jon Roth. In 2009, after original founder Dean Zelinsky left the company citing creative differences, Rubinson made the unusual decision to change his name to Elliott Dean. The Dean Dave Mustaine Zero Korina electric guitar was designed by Dave Mustaine with Dean’s master guitar builders to create a super Axe that meets Mustaine’s metal needs. The body is made from korina, a wood that is similar to mahogany but is much lighter. The Zero features a 25-1/2″ scale length and a modified Z-style body with sharper angles and edges. The special set mahogany “D-shaped” neck is both fast and comfortable. This is definitely a shredders neck. The Zero is housed with Dave Mustaine Duncan Live Wire humbuckers that are a power house of aggressive tone. The pickups are well balanced with a mix of warm, tight, crisp and clear tonage. The guitar’s string-through-the-body produce a surprising amount of sustain. I haven’t played much with guitars made of this wood but I am pleasantly surprised with the tone and feel. Very well done. The Zero utilizes dual volume, single tone, and a 3-way switch, which is the control set up that Dave prefers. With a nitrocellulose lacquer finish, the Dean Dave Mustaine Zero Electric Guitar is a beast that feels like nothing you have ever played. 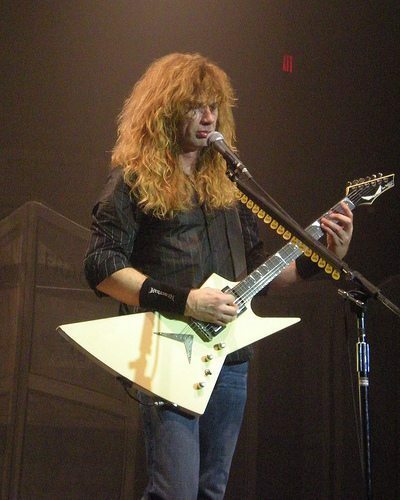 In conclusion, the Dean Dave Mustaine Zero Electric Guitar is pretty much the epitome of a metal guitarist dream axe. It is both fast and with brilliant metal tone that will melt faces and bring your playing to a new level. The Zero is light and comfortable which will allow you to carry the axe for longer periods of time without strain. The Live Wire pickups are super hot but do not break up at high volumes. They have a nice balance of mids and highs with the lows set just behind, ready to blast out when you need them. The Zero is an all around great guitar that can be used for both lead and rhythm. It’s a little on the high priced side because it’s a signature guitar, but it’s a nice alternative for those to the Explorer’s or Kelly’s. Try one out and see for yourself, the Zero just might be your next guitar. Pro- Fast neck, Light weight, Awesome pickups, Sleek look, Grover tuners.